With the advent of Photoshop in the design industry, it has been easy for the media NOT to keep it real. Photoshop has allowed advertisers to give cover models a little superficial nip and tuck or body sculpting where it doesn’t really exist. These false images can affect the way readers see beauty in an unrealistic way, impacting self-esteem and their own body image. The more women and girls watch television or look at magazines full of unattainable and idealize images of women created by “photoshopping”, the more anxious and insecure about their appearance they become. The pressure to attain the “perfect body” has women now spending millions of dollars a year on unnecessary plastic surgery and harming their bodies by becoming anorexic or bulimic. In recent years, researchers have tried to understand the determinants of body image disturbance among young women. High exposure to media has been shown to have a large impact on women’s self-esteem in western societies. Nowadays, with the use of Photoshop, women have been tricked into thinking that flawless beauty does exist. But in reality, this type of perfection is simply unattainable. Even celebrities have imperfections, but that’s not what we often see in the magazines. Some celebrities, such as Brad Pitt and Kate Winslet, have taken action against digital altering of their bodies. Brad Pitt broke one of Hollywood’s golden rules in a recent issue of W Magazine by revealing all his flaws and wrinkles. He even personally requested to be photographed by Chuck Close, who is famous for his extremely detailed portraits that reveal all skin flaws. Winslet was also one of the first to break ground when she took action against GQ magazine for digitally altering her body in its photographs that made her look unrealistically thin. Perhaps if more celebrities become more secure with their own body image and demand that their photos be printed without photoshopping, everyone else will follow suit. And more women and girls will realize that there is no such thing as “perfect” beauty. For the past three days,The Keep it Real Campaign sponsored by Miss Representation has been asking advertisers and the media to do away with Photoshop and print at least one unphotoshopped picture of a model. 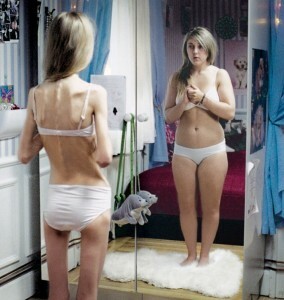 One photo may not be enough to fix someone’s self esteem, but maybe it will help advertisers understand the damage that they are doing to the physical, emotional, and mental health of many women and girls when they don’t keep it real.